The Albany-Santiam Canal in Lebanon: Tranquil water despite the fight. In the so-called water war between Albany and Lebanon, water is not the issue. Money is, and even more than money, it’s bull-headedness. So Monday’s offer of a compromise from Lebanon comes as a welcome sign that finally at least one side is cooling down and talking sense. Water is not the issue at all. As owner of the Albany-Santiam Canal since 1985, Albany has faithfully delivered water to Lebanon with no interruption I know of. It is prepared to continue doing so as long as the South Santiam River flows. What Albany wants is more money from Lebanon toward the operation and maintenance of the 18-mile canal that serves both towns. Albany also wants Lebanon to pay certain capital expenses. It’s not clear which ones, and Lebanon believes Albany wants it to pay retroactively for part of the $6 million in improvements at the canal’s intake done about 10 years ago in connection with Albany’s hydropower license. Regardless of which expenses Albany has in mind, a 1986 agreement between the cities says such expenses must be agreed on by both ahead of time. Lebanon says this was not done, so it doesn’t owe more than $8,000 a year it has been paying, certainly not the $1.2 million Albany once demanded. Things got out of hand last week when Albany demanded that Lebanon at once quit pumping canal water into Cheadle Lake and remove its pump, a truly puzzling demand since Albany had authorized the pump in 2010. It was even more puzzling — and a public relations disaster for Albany — because everyone can see there is absolutely no risk that the Cheadle Lake embankment could become a failing dam, certainly not this summer. Lebanon responded by changing the locks on some gates and threatening to arrest any trespassers from Albany Public Works. That’s where things stood when Lebanon publicized its offer of a compromise Monday. Lebanon would pay Albany $125,000 a year as its share of canal costs, plus $8,000 annually toward capital improvements as informally agreed by the respective former public works directors in 2006/7. 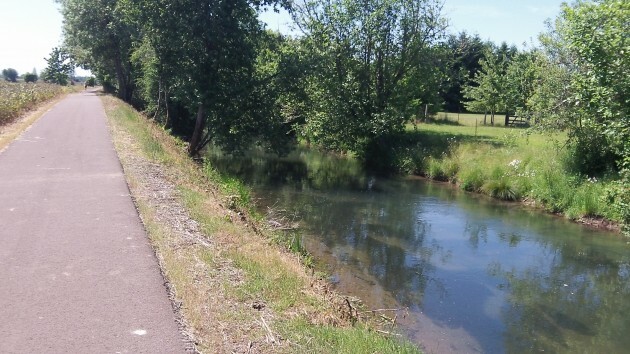 In return, Albany would support Lebanon in any state and federal permitting processes as it seeks to get off the canal and take water directly from the South Santiam. As for Albany’s complaint that Lebanon uses the canal as a storm sewer for surface runoff, Lebanon is proposing that Albany produce any “historical baseline data” to nail down some facts. Once that is in hand, Lebanon suggests negotiations among all “canal users” to tackle this issue. As always Hasso…well stated. I have never seen a Mayor act like this.. in such a public way. How can any good come out of these contentious actions? There appears to be a personal motive from Ms. Kanopa….I am sad that she has chosen this path. None of this is a “personal” basis via the Mayor. The city council has signed off on the process before any of the letters have gone out back & forth between the Mayor and/or City Manager. I would be very surprised if that was not the case in Lebanon also. Goes to show ya…That Police/Fire levy got passed so it must be a slow day on the council. “So let’s pick a fight!” they yawn. Why should Lebanon pay? The canal goes thru their town leaving them for up keep & mostly benefits Albany. Here’s an idea. Look for Federal funds. The ditch is already there. Put a pipe in, no need for pumping stations as it’s gravity fed already, cover it over and no problem. Go back and read other stories and posts. You have no idea about what is going on here. You could not be more off-base. Thank you for the great write up on what is going on in the Lebanon-Albany Canal Dispute. This is a great summary that shows what is going on and where this is going. The only thing I disagree with is your assertion that Lebanon shouldn’t move forward on our own water intake. I feel it is very prudent for Lebanon to get its own, fully controlled, water source. Albany has shown it is willing to try and use force to leverage its ownership of the canal to get what it would like (I’m sure people remember the whole “Let them flood” comment), and Lebanon being in control of its own water will protect the town from any more strong-arming- especially if water becomes a precious resource in the future like I fear it will become. Thought about it plenty. I still want Lebanon to move forward. Our own water access that we control is worth far more than even a $20 million bid, even if I do say it myself. I believe that water will become a global scarcity and even within our own region a hotly contested resource. Being in control of our community’s most basic need is smart governance. Removing this point of leverage from Albany frees us to be in better control of our own livelihood and prevents Albany from trying to leverage the canal again- be it in 30 years or 100 years from now. Call me risk adverse, but I’m a firm believer in the aphorism “once bitten, twice shy”.